What is Rich Text Format? Rich Text Format (RTF) is a standardized way to encode various text formatting properties, such as bold characters and typefaces, as well as document formatting and structures. By saving a document in RTF, you can open the file in many word processors and other RTF-aware software packages with much of its formatting left intact. Many word processing programs will allow you to save a document in RTF when you select Save As... .
Rich Text Format (RTF) is a type of document file that can be read and edited by many different word processors. Its file extension is .rtf. You might be requested to send an RTF file as an attachment over email or need to share a file with someone who uses a different word processor. It's easy to save a file in Rich Text Format. PDF to RTF Converter instantly converts PDF files into Microsoft RTF documents that look just like the original - complete with all formatting and images! Information is set free - free to be edited and free to be integrated into your documents. PDF to RTF software is a standalone program and does not require Microsoft RTF software, Adobe Acrobat, or even Acrobat Reader. PDF to rtf is a batch PDF Converter that you can convert a lot of PDF files to rtf documents once time! saving your time! VeryPDF PDF to RTF Converter is easy and friendly, allowing you to convert a file fast. Select the file you want to convert, Save to DOC format, OK.
VeryPDF PDF to RTF Converter includes a review screen allows you to scroll through the pages of your PDF document or zoom in and out. You can quickly review the converted file before you print it or save it to your computer. You don't have to buy additional software to edit the converted file with so many file formats for saving the converted document. You can edit these converted documents in your favorite word processor or image editor. VeryPDF PDF to RTF Converter has a powerful set of advanced options for all output formats. This document describes why RTF (Rich Text Format) is a widely-used method of sharing documents, and provides tips on its use. 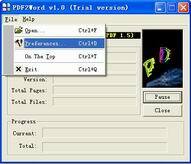 Widely Readable - All major word processors and many other types of programs can read RTF text. Preserves Basic Formatting - Font information and text styling selections are preserved in RTF. Offers Security Advantages - RTF is a more trustworthy format than .DOC, and it doesn't leave an "edit trail." Smaller File Size - Because it doesn't save document history data, an RTF file is smaller and therefore easier to send as an email attachment. RTF was established by Microsoft as a "lingua franca" that would, like ASCII, be readable by all common word processing programs. ASCII, while handy because any program can read it, is limited to basic characters. It can't include any font or styling information, and is therefore quite limited. A wide variety of programs, from word processors to desktop database applications to email clients can utilize RTF. Also, it doesn't matter whether you're on a Macintosh, UNIX, or Windows computer -- RTF works across operating systems. RTF will not retain complex formatting such as table information, graphic alignment and pagination or macros. However, it does retain font selection, font sizing, and text styling (bold, italics, underline) and depending on the application, font coloring. For most common documents, this is more than enough formatting. In fact, RTF is often used in the pubishing world as a format for rough drafts. Once the initial editing is finished, the RTF is imported into Quark XPress, Adobe InDesign, or some other page layout program for final formatting. This allows editors to focus on editing content, without the distraction of too much formatting. Microsoft Word macro viruses are one of the single biggest security problems on the Internet. Millions of unsuspecting users have sent macro viruses to everyone on their email address list because they sent their documents in .DOC format. While antivirus products can often detect and eliminate these viruses, it's even easier to simply save documents in RTF. Since RTF does not accept macros, it can't harbor macro viruses. Some versions of Microsoft Word by default keep the "auto save" feature turned on. This means that a Word document saved as .DOC carries historical information about editing that has been applied to the document. This is normally not an issue, but with sensitive documents where you don't want recipients to be able to view all the text you modified and deleted, RTF is a good option. Because it can't contain macro or complex formatting information, an RTF file takes up less memory. This makes it a very handy format for Web downloads and email attachments. Also, if you don't have much room on your hard drive, using RTF for all but the most complex documents can save valuable space.